Say this about the Marine Corps’ new top enlisted adviser: He certainly doesn’t mind calling things as he sees them. That has become abundantly obvious since Sgt. Maj. Mike Barrett became the 17th sergeant major of the Marine Corps on June 9, taking over for retiring Sgt. Maj. Carlton Kent. Barrett, a scout sniper, already has raised eyebrows in some corners, particularly with his blunt comments on the repeal of the Don’t Ask, Don’t Tell policy were published last month. This week’s Marine Corps Times cover story includes more of that frank talk. 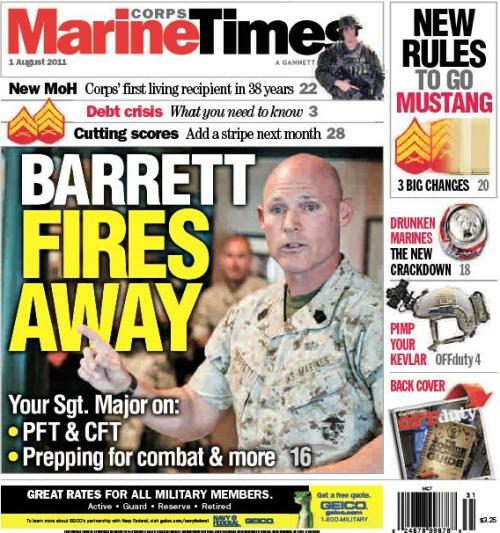 In his first interview with our newspaper, Barrett discussed a variety of issues on the record last week, touching on everything from whether the Combat Fitness Test should be tougher to what it takes for Marines to be ready for combat. He also outlined plans for the Sergeant Major of the Marine Corps Symposium, which will bring senior enlisted leaders from across the service together in Washington from Aug. 1 to Aug. 5. The latest edition also includes expanded coverage of the White House decision to make Dakota Meyer the first living Marine to receive the Medal of Honor in 38 years. And, it outlines three big changes that will toughen the Corps’ enlisted-to-officer programs. For more details, check the paper out on newsstands, or subscribe online here to read it now. I am a retired Army CW5 but this is one Sergeant Major that got my attention as he speaks out on certain subject matters. He is a true warrior and will be good for the Corps.